AUSTIN—Today, Lt. Governor David Dewhurst and five members of the Texas Senate sent a letter to Senate Majority Leader Harry Reid and House Speaker John Boehner urging Congress to immediately approve construction of the Keystone XL Pipeline that could potentially add thousands of new jobs and generate millions of dollars to the Texas economy. "The State Department has now had three years to review the Keystone XL pipeline proposal, and the benefits are resoundingly positive," wrote Dewhurst and the Senators. "Construction of the pipeline is estimated to create 20,000 jobs, support 118,000 spinoff jobs for local businesses and generate more than $20 billion in economic output." Dewhurst was joined by Texas Senators Bob Deuell (R-Greenville), Troy Fraser (R-Horseshoe Bay), Joan Huffman (R-Southside Place), Mike Jackson (R-La Porte) and Tommy Williams (R-The Woodlands). "As Texans, we cannot emphasize enough how important the Keystone XL project is to our state," the Texas lawmakers continued. "We have thousands of highly-skilled workers here in Texas who would eagerly fill the positions created by this project. The project would bring as much as $2 billion in economic output and $41 million in tax revenue to Texas − money our state could use to avert future budget shortfalls created by the weak national economy." Members of the U.S. House and Senate have introduced several legislative initiatives in the past few weeks intended to win Congressional approval of the project over the objections of the White House and Secretary of State Hillary Clinton. 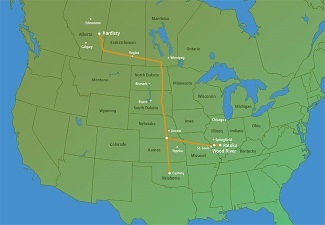 The 1,700-mile long pipeline would stretch through six states and more than 15 Texas counties, safely transporting crude oil from Canada to refineries in Texas. "Please do not allow the Obama Administration to put Presidential politics or the interests of radical environmental groups ahead of the economic welfare of our country," the letter concluded. "Americans have already waited three years for the approval of this important proposal, and they cannot afford to wait any longer."